Downtown Detroit’s Guardian Building is a standing tribute to the Motor City’s early glory days and art deco skyscraper architectural design. Northern Michigan’s Ezra Winter played a hard-to-miss part in its success. His three-story Michigan map mural dominates the whole south wall of the building’s upper bank lobby. 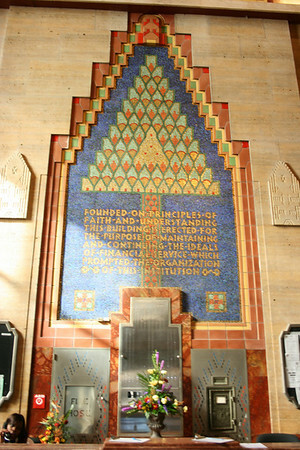 He was one of several artists whose work can be found in the 40-story Guardian Building. Winter, a well-known and respected American mural artist from the 1920s through the 1940s, was born in Manistee, grew up near Traverse City and graduated from high school here in 1905. He is featured in the Winter 2011 of Reflections By The Bays quarterly magazine, published by the Record-Eagle. The Michigan map mural is his best-known work in the state. For the full story about Ezra Winter, pick up the Winter 2011 edition of Reflections, available on newsstands now. Sunshine floods into the main lobby of the Guardian Building's main lobby and lights Ezra Winter's "White Pine" mosaic behind the reception desk.